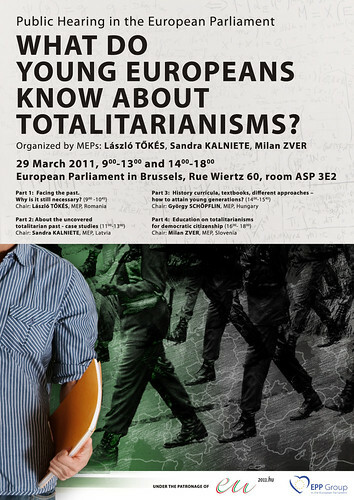 Rolf and I have somehow managed to have been invited by none less than a vice president of the European Union Parliament to speak at a Public Hearing in the EU Parliament called "What Do Young Europeans Know About Totalitarianisms". Aside of course from the widening of what we're doing in terms of it being European vs. just a little research project turned sort of a real thing, and this being pretty insane for yours truly, it already brings up a lot of questions about what happens after we're done. We're going to be presenting our work on Spomenik and I imagine expanding the notion of what it is in a European context. So this means basically we're looking at what we're doing in terms of a platform, and not just a thing. One of the original ideas of Spomenik and to an extent, the Pervasive Monuments project is that its a system, and systems are generally things you can apply to other situations. Recently while in Slovenia at the 2nd Anniversary of the Opening of the Huda Jama Mass Grave, I was asked "couldn't you make this just as easily for the Partisans and Tito?" Yes we could. Its a system. What we're looking at with this project is memory and and remembrance, and try to cobble this into a system means you open it up for interpretation and recontextutalisation. You could make it for other situations. We've talked about Bosnia, been asked about Spain, and of course we're working already in Rwanda. The thing for me and this in design and well, just being someone trying to do the right thing with what they've got, is that a lot of times what you do is a lot bigger than you ever think it is, or could be. Most of the time, designers make their pretty little pictures, and I've done it myself loads of times, and then you're done with it, without thinking of how you could make something really mean something to someone's lives. If for some strange reason I was asked to tutor or teach somewhere I would make my students get out in the real world and try to get at least one real person to use their thing for real. Well hopefully when we're done with this whole Pervasive Monument thing for now, maybe some random kid in Kranj or Kigali will, without us giving it to them and watching, and actually remember, commemorate or just contemplate for a second.